Angry Birds Star Wars is an action video game, a crossover between the Star Wars franchise and the Angry Birds series of video games, launched on November 8, 2012. Recently Rovio released new version - 1.1.2. 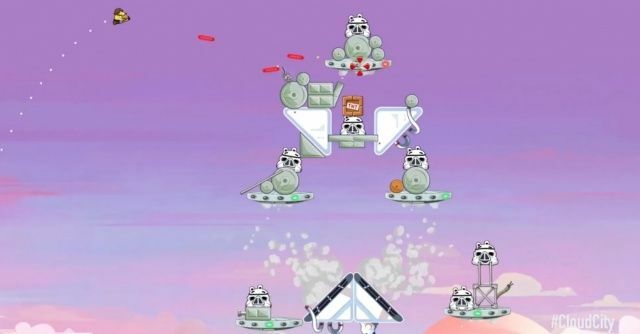 Angry Birds Star Wars currently has 6 worlds on most platforms. They are Tatooine, Death Star, Hoth, Cloud City, Boba Fett Missions, Path of the Jedi and the Golden Droid bonus levels. March 28, 2013, introducing a brand new Cloud City episode with 20 new Bespin levels. And if you find 5 mandalorian jetpacks, you will unlock 10 more Boba Fett specific levels. Two new bonus levels are also part of the update. Now you can Download Angry Birds Star Wars (V 1.1.2) from my cloud. If you have already installed Angry Birds Star Wars V1 you don't need to download it. You can update easily from update option in your game. If you are facing any error while updating, you will need to do a fresh install. if you want to play all levels, you will need to download patch then run patch and patch angrybird.exe from your installation directory.